More information on the trial is available at www.clinicaltrials.gov (NCT03504410). Rafael Pharmaceuticals, Inc. has initiated a Phase 3, multicenter, open-label, randomized, pivotal trial (ARMADA 2000) to evaluate the efficacy and safety of its lead compound, devimistat (CPI-613®), in combination with high dose cytarabine and mitoxantrone (“CHAM”) in older patients with relapsed or refractory acute myeloid leukemia (AML). ARMADA 2000 will compare the efficacy and safety of high dose cytarabine and mitoxantrone (“HAM”, control arm) with the CHAM combination. Patients ≥ 60 years old with relapsed or refractory AML and an ECOG performance status of 0 to 2 are eligible for enrollment. The primary efficacy endpoint will be Complete Remission (CR). Secondary endpoints include the evaluation of Overall Survival (OS) and Complete Remission with Partial Hematologic Recovery (CRh) as well as safety. A total of 500 patients will be evaluated in ARMADA 2000 at approximately 87 sites in 12 countries. The interim analysis of the study is expected to be completed as early as Q1 2020. More information on the trial is available at www.clinicaltrials.gov (NCT03504410). was 45% with median survival was 10.4 months. In the combined data of these two trials, elderly patients (≥ 60 years) with relapsed or refractory AML dosed with 2,000 mg/m 2 of devimistat, exhibited 52% CR+CRi with median survival of 12.4 months. In both studies, the treatment was well tolerated. Frequent adverse events included Anemia, Neutropenia, Thrombocytopenia, Leukocytopenia and Lymphopenia. Given these results, further evaluation of devimistat in the ARMADA 2000 Phase 3 trial is warranted. Please contact Sanjeev.Luther@rafaelpharma.com or Timothy.Pardee@rafaelpharma.com. More information on the trial is also available at www.clinicaltrials.gov (NCT03504410). Devimistat is a first-in-class drug developed based on Rafael Pharmaceuticals’ Altered Metabolism Directed (AMD) platform. Devimistat targets altered regulation of metabolic processes specific to cancer cells. It is designed to be highly specific, to simultaneously attack multiple targets, to be minimally toxic and to have broad spectrum activity across a wide variety of cancers. CPI-613 is being or has been evaluated in 18 ongoing or completed trials as a single agent, as well as in combination with standard drug therapy for hematological malignancies and solid tumors. To date, over 300 patients have received one or more doses of CPI-613. In pancreatic cancer, CPI-613 in combination with modified FOLFIRINOX exhibited an objective response rate of 61%, median overall survival of 19.9 months and median progression free survival of 9.9 months. In elderly patients with AML, CPI-613 in combination with high dose cytarabine and mitoxantrone exhibited 52% CR+CRi and 12.4 months median overall survival. In T-cell lymphoma, CPI-613 in combination with bendamustine exhibited a 75% overall response rate. CPI-613 has been granted orphan drug designation by the U.S. FDA for pancreatic cancer, AML, MDS, peripheral T-cell lymphoma and Burkitt’s lymphoma. The EMA has granted orphan drug designation to CPI-613 for pancreatic cancer and AML. Ferrara F, Schiffer CA. Acute myeloid leukaemia in adults. Lancet (London, England). 2013;381(9865):484-495. Gutierrez SE, Romero-Oliva FA. Epigenetic changes: a common theme in acute myelogenous leukemogenesis. Journal of hematology & oncology. 2013;6:57. Kubal T, Lancet JE. The thorny issue of relapsed acute myeloid leukemia. Current opinion in hematology. 2013;20(2):100-106. Pollyea DA, Kohrt HE, Medeiros BC. Acute myeloid leukaemia in the elderly: a review. British journal of haematology. 2011;152(5):524-542. -Tim Pardee MD; Ph.D. was the site principal investigator for early Phase I/II clinical trials at Wake Forest Baptist Medical Center. -Bayard L. Powell, M.D., Section Chief, Hematology & Oncology, Associate Director for Clinical Research, Comprehensive Cancer Center, Professor, Hematology & Oncology, Wake Forest Baptist Medical Center serves as a member of Rafael Pharmaceuticals Medical Advisory Board. -Boris Pasche MD; Ph.D. Director, Comprehensive Cancer Center and Chairman, Department of Cancer Biology, Wake Forest Baptist Medical Center, serves as a Board Member to Rafael Holdings, Inc. (NYSE American: RFL) which is an investor in Rafael Pharmaceuticals, Inc. This press release contains forward-looking statements. These statements relate to future events or the company’s future financial performance. In some cases, you can identify forward-looking statements by terminology such as “may”, “will”, “should”, “expect”, “plan”, “anticipate”, “believe”, “estimate”, “predict”, “potential” or “continue”, the negative of such terms, or other comparable terminology. These statements are only predictions. Actual events or results may differ materially from those in the forward-looking statements as a result of various important factors. Although we believe that the expectations reflected in the forward-looking statements are reasonable, such statements should not be regarded as a representation by the company, or any other person, that such forward-looking statements will be achieved. The business and operations of the company are subject to substantial risks which increase the uncertainty inherent in forward-looking statements. We undertake no duty to update any of the forward-looking statements, whether as a result of new information, future events or otherwise. In light of the foregoing, readers are cautioned not to place undue reliance on such forward-looking statements.  Chief Medical Officer, Rafael Pharmaceuticals, Inc.